“It is hard to feel really good about the structure of the US stockmarket. I don’t feel good about the relationship between our financial sector and the rest of society. It is still screwed up. “It is distorted by a lot of government help that the big banks have received. It bothers me a lot that we still have “too big to fail”. “It really seems to me that we can’t have capitalism for everybody but the capitalists. One group is then living by “if you fail you fail (and suffer all the consequences)” and another group in society (who happen to be elites) living with a net below them – they never fail, no matter what they do to everybody else. There is an inequity there. 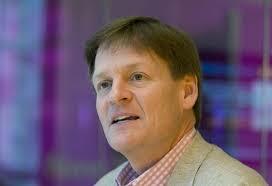 Michael Lewis was speaking at the Free Library of Philadelphia in March this year as part of the Author Events program.